Swales are linear grass covered depressions which lead surface water overland from the drained surface to a storage or discharge system, typically using road verges. Unlike a conventional ditch, a swale is shallow and relatively wide. It provides temporary storage for storm water and reduces peak flows. They are located close to the source of runoff and can form a network within a development linking storage ponds and wetlands. A swale is dry during dry weather but in wet weather, rainwater flows into it along its length and moves slowly through the grass area. The grass slows down and filters surface water flows. Sediment is deposited while oily residues and organic matter are retained to be broken down in the top layer soil and vegetation. The underlying aquifer can be protected, if needed, by placing an impermeable lining under the swale below the soil. During a rainfall event a proportion of the runoff can be lost from the swale by infiltration, and by evaporation and transpiration. Overflows can be provided to allow conveyance during periods of exceptionally heavy rainfall. Swales should be designed to be dry between storm events to enhance their pollutant removal capability. Swales work best with small gradients both for their side slopes and along their length. Performance can be enhanced by placing check dams across the swale to reduce the flow rate which, in turn, reduces the risk of erosion in a swale. 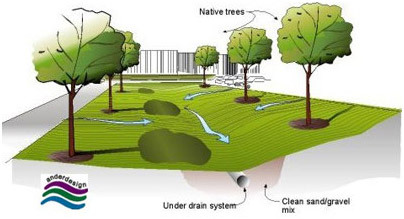 The pollution load can be considerably reduced even where swales discharge directly to a watercourse. In addition, where runoff is conveyed via surface channels, wrong connections become obvious and can be fixed without the need for expensive surveys. View sites in Wales with a Swale system.